Park officials are brainstorming ways to utilize the ribbon during the off-season. 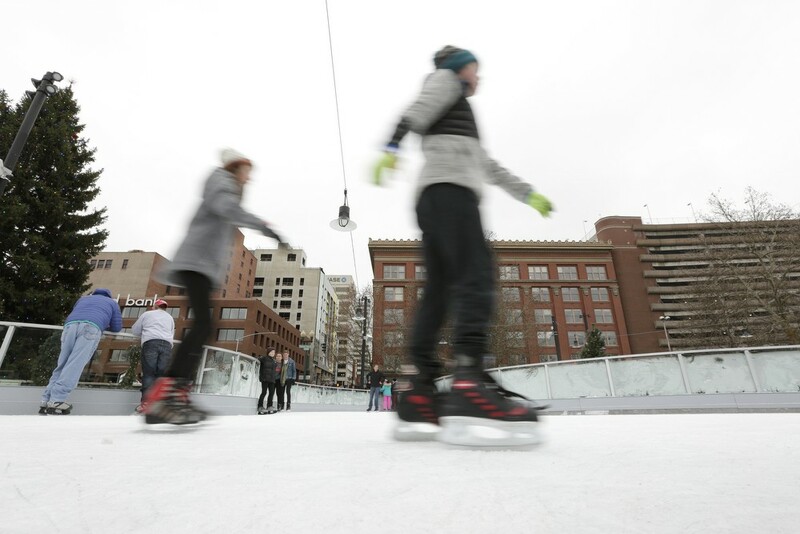 Attendance has dropped precipitously at Riverfront Park's ice ribbon, a roughly $10 million skating rink and a signature piece of the park's broader redevelopment effort. The ribbon, which first opened in 2017 after a series of delays and setbacks, attracted 53,338 guests during its first winter season. This past winter that number dropped to around 47,654, according to the latest figures from the Spokane Parks and Recreation Department. But the first season was about half as long as this year's. Last season, the ribbon opened on Dec. 8 and stayed operational for 58 days before abruptly closing on Feb. 3 due to broken equipment. In contrast, during the 2018-19 season, the ribbon was open from Nov. 17 through March 17 for 121 days. So, when considering the different durations that the ribbon was open, the change from 53,338 guests to 47,654 guests represents an roughly 57 percent decrease in the average daily visitor rate. City staff and other proponents argue that this is the natural trajectory of such a project, and that it isn’t failing in its mission of bringing life to the park. “Following seasons usually drop, and it’s very normal,” he adds. Fianna Dickson, communications manager for the Spokane Parks and Recreation Department, notes in an email that, during the 2017-18 season, attendance peaked at the ribbon's grand opening and through December before tapering off in January. Moog says that he can’t “speculate” on any their projections for attendance numbers for next year’s skating season, but he and other city staff stress that the ribbon is attracting more visitors than the city’s previous rink, the Ice Palace on Havermale Island, which reportedly garnered around 30,000 people during the winter season prior to its closure. "In addition to the ribbon performing better than the former Ice Palace, it's also activating a corner of the park that was underutilized in its connection to downtown and the Skyline," Dickson writes in an email in response to the decreased average daily attendance rate. "The ribbon provides a unique urban experience." Nick Sumner, president of the Spokane Park Board, agrees that a dip in attendance is natural. However, he adds, they’re having to look at ways to cut costs, given increasing operating expenses, such as the rising state minimum wage. “We’re working hard to make sure that we don’t have to raise ticket prices,” he says. Moog says they plan to continue their summer programming this year and are “brainstorming” new concepts, such as hosting a mock "beach day" and converting the ribbon into a volleyball court. While it may take the city a little bit to figure out how to maximize its usage of the space in the broader vision of a vibrant downtown waterfront, Sumner says that, in the long-term, the project will pay off. Kris Dinnison, co-owner of Boo Radley’s located on Spokane Falls Boulevard near the ribbon, tells the Inlander that, anecdotally, the ribbon has boosted their business and has helped revitalize the area. This post has been updated to correct the duration of the ribbon's opening season.